The first poster discussed the importance of biogeography as a tool for dereplication and in determining future sampling sites. 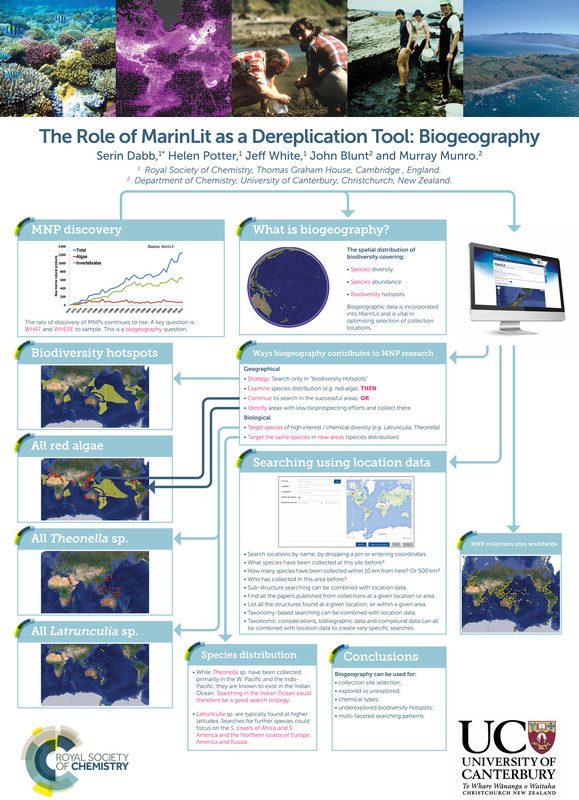 It highlights how the location search in MarinLit can assist in these efforts. The second poster covers the powerful functional group search and how it can simplify dereplication efforts, without needing full interpretation of an NMR spectrum. The posters are available above as image files. If you would like a copy of the high resolution pdf of either poster, please get in touch and we would be happy to send it to you. Thanks to the dedicated work of Prof. John Blunt and Prof. Murray Munro, all compounds in MarinLit now have their original collection location attached (as recorded in the original article). This extends the location search over another 9000+ collection sites and 30+ years of articles, allowing for even more powerful searching. Previously, the collection location was only included for compounds from Rhodophyta and compounds published post-2013. Location searching can be combined with the other searches in MarinLit, such as taxonomy or compound properties, to quickly get you to the results you are looking for. 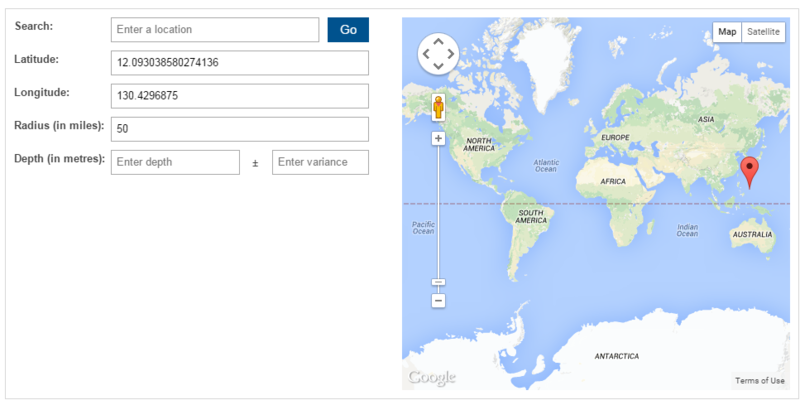 To start using the location search, click on the link from the home page. For more details, please see our help page. Our latest update for MarinLit is now live! We have added 739 new articles and 660 new structures in this update, which contains all the remaining structures and articles from literature that was published in 2014. You may have noticed that 2015 articles are already appearing in MarinLit. We are moving toward updating MarinLit continuously, so updates will appear as soon as possible after their publication in the literature. New articles and compounds will be added throughout the year, to keep your searching as up to date as possible. You can see the last updated date for MarinLit in the top right corner of the homepage, next to the article counter. We have now come to the end of the beta-testing phase for MarinLit. We would like to say thank you to all the beta testers who have provided us with their valuable feedback so far. It’s not too late to have your say – if you have any comments on MarinLit or ideas for future developments, please do get in touch. You can either click on the Feedback button on each page or send an email via the Contact Us page. We have recently rolled out an update to MarinLit that significantly builds on the functionality already established. Most importantly, we have added the ability to search using all of the Bibliographic, Compound and Taxonomy data in a single search. 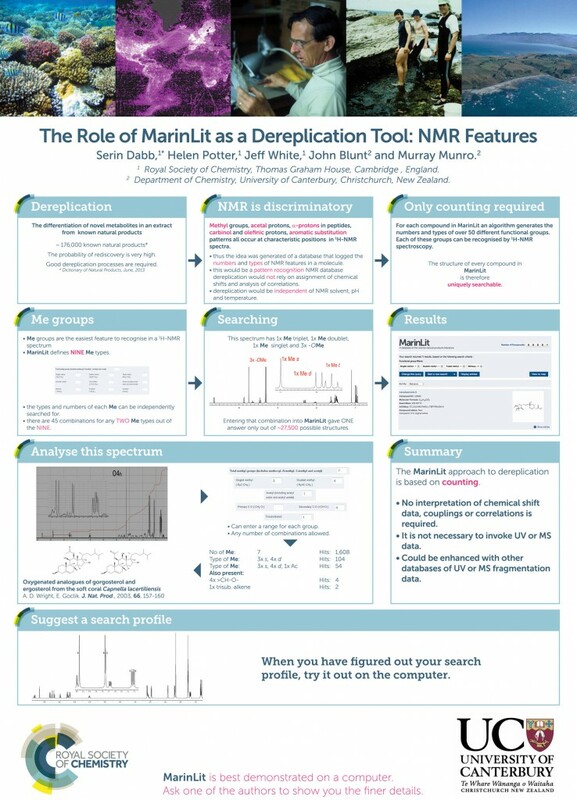 We have also added to and improved some other areas of MarinLit – see below for more details. It is now possible to combine any and all of the Bibliographic, Compound and Taxonomy searches. To do this, simply start in one search, fill in the criteria, and then navigate to the next search using the blue buttons at the top of the page. Your search criteria will be carried across to the new search page. Marine categories are now arranged by type in a hierarchy. All categories within a group can now be searched by selecting the top level group. Once a taxonomic name is selected, both higher and lower levels of the taxonomy are restricted only to possible combinations. Results can now be filtered by marine category, in addition to author and journal. The Bibliographic search has been streamlined and the marine categories are now searchable by hierarchy. Full details of how to use the new features are available on the How to Search page.